MIAMI, FLORIDA, UNITED STATES, February 13, 2019 /EINPresswire.com/ -- Children with neurological or genetic disorders and developmental delays such as those associated with autism, cerebral palsy, and epilepsy need supportive therapy to experience a better life. Yet therapy is often so expensive as to be out of reach for many. 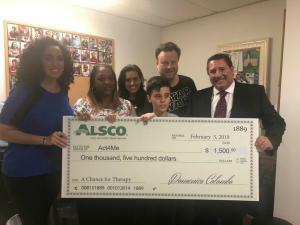 To help in such cases, the Alsco Miami Branch has offered its support to Act4Me, a nonprofit organization that works to provide children with access to the treatments they need to address their developmental delays.